PEOPLE HAVE ASKED ME ABOUT a post that I wrote a little while back where I downsized my backpack from an 80 litre to a 45 litre bundle of joy. How did I do it? What am I carrying? I wasn’t totally sure so one day in Sucre I laid it all out and took stock. I had bought a couple of extra things, but it still surprised me: it looked like a lot. Wash bag. This tough bag by North Face is waterproof but although it holds things in snugly, I find it a bit awkward to use on a daily basis. First aid kit. Everything from antibiotics to anti-malarials and antiseptics. Anti-everything, then. Oh, and some vitamins, plasters/band-aids and a thermometer. Second wash bag. Yes. Two washbags. Excessive. This one contains items that I don’t use often, such as anti-mosquito spray, make-up for nights out, spare razor blades, that kind of stuff. Electronics pouch containing chargers and cables. And a converter that works EVERYWHERE. Sun hat. My third one in the last year. The Inca Jungle Trail claimed one, a bus in Ecuador another. I get sunstroke and sunburnt fairly easily so head protection is a must. Merino buff®. This works out to be a scarf, hat, muff or whatever you want it to be. I barely used this but it is small, light and has been a blessing during some chilly moments, like in Cuenca. Zip up tops x3. One hooded fleece, one lightweight base layer and one heavier, lined hoodie. A RAB down jacket that folds down into its own pocket, and a raincoat. The raincoat was used fairly regularly, and although it took a month and half before I needed some extra warmth, the down jacket was a beautiful cuddle when I visited the glacier in Peru. Travel towel. A little bigger than I needed; smaller would have been fine. Pants/undies/bra x10. There is no point skimping on underwear, I realised, so I stocked up in New Zealand. Legwarmers x2. Some Bolivian additions that are well loved in the chilly climate. Socks x4. One thicker pair for walking, the rest cotton. Other than when I went on hikes or travelled in Bolivia, for most of my travels my socks stay have stayed buried at the bottom of my bag. Eye-mask. Nothing exotic, just a freebie from the airplane but I wouldn’t travel without. Totally useful in hostels or when on overnight public transport. Shorts x 3. One longer pair, one roll-up, and one short. Two pairs would suffice. Jeans, combats and zip-off synthetic walking trousers. People say not to travel with jeans. Well I like them, so tough (and I have to carry my bag so I only have to face myself on that one really). I did downsize from proper jeans to skinny legs to save on a bit of space, but actually these are less versatile and only worn in cities or on nights out. Silk sleeping bag liner. I’ve used this less than I expected but the moments when I need some extra warmth or an extra layer between me and the bed bugs, it is great. Skirts x 2 and one dress. My skirts are all casual but absolutely adaptable for when I need to glam up a little. Black leggings and PJs. When I got to Oz I downsized my PJs to a shorty set to save on space. The leggings are great worn under trousers or with a skirt when it is cold. T-shirts x4: black, blue, yellow and white patterned. Versatile. Nothing fancy. Belt. Not always needed but was still worth having, either to hold my trousers up when I lost weight after my parasite incident back in Ecuador, or to open bottles with the built in opener (something I only discovered en route). Bikini. I did start my trip with two bikinis but my favourite set got left behind on a washing line in Raglan, New Zealand. One bikini, realistically, was enough. Long sleeved t-shirts x5. Mostly in plain, light cotton ideal for layering, these are adaptable to smart or casual situations. One of my favourites for that extra snug hug is my Howies’ merino top (although it has been so well worn that it is now pretty holey. Want to send me a new one, guys?!). Vest tops x 7. It may sound like too many, but I do use them all. Pretty much. And they don’t take up much space at all. Two of the seven were more going out style tops. Teva hiking sandals. Brown leather, these can come across fairly smart when I need them to whilst still being totally practical and cushioned comfortable. Salomon hiking shoes. Dark brown colour is perfect for making these not stand out too much or show the dirt too obviously. These are my go-everywhere shoes that are comfy, have good grip and are Goretex® waterproofed. The only downside is that in some countries I’ve found them to be a little too hot. Converse casual shoes. I didn’t have a pair of ‘hang-out’ shoes and didn’t intend to get any either as my trainers had doubled up fine for this purpose… but then in Bolivia I decided to buy myself a cheap pair of Converses. Probably fake but they fit and do the job. Flat, strappy sandals. Super light, these barely take up any space at all. After a backpacker in New Zealand lent me some sandals for a night out, I decided to go girly and get in on the action. And these sandals have actually been well used. Flip flops. I travelled for six months with just one pair but when I got to Brazil, home of the Havaianas, I couldn’t leave without another! Totally useful, including when using communal showers. Head torch. Most used item in my backpack, maybe? I keep this close at night and pack it at the top of my bag so that when arriving, for example, into a power cut Villa Serrano late at night, I can still find my way. It is a lot, yet somehow it all fits into my 45 litre Berghaus backpack. Sure, it’s a bit of a squash but it weighs in at 15kg and is a doddle to carry around. I guess I should mention that I use some roll down vacuum bags. They’re great for packing things down small and keeping similar things together. And! – I carry a little day pack with my sunglasses, wallet, water, pen, paper, and other valuables that I want close by, including a fake wallet with some old cards and a bit of cash so that if I get mugged, I can hand over something without losing everything. I always carry a photocopy of my passport (in each wallet) and I’ve found laminating them to be really helpful (compared to other travellers’ tatty bits of paper that means they often have to still produce real identification, my copied ID often gets me past official check points without any bother). Looking at the above picture, I realise that I could quite easily prune my luggage a lot further but there does come a point where it’s quite nice having SOME choice. So, if YOU’RE heading off soon and thinking of throwing in hair straighteners and high heels, just stop for a moment and think about the kind of travelling that you’ll be doing. A weekend in Paris? Maybe. A month trekking and roughing it? Nah. The tousled, flip flopped look will work just fine. Trust me. Travelling with too much stuff? Time to downsize! 45 litre versus 80 litre. Downsize to happy times. 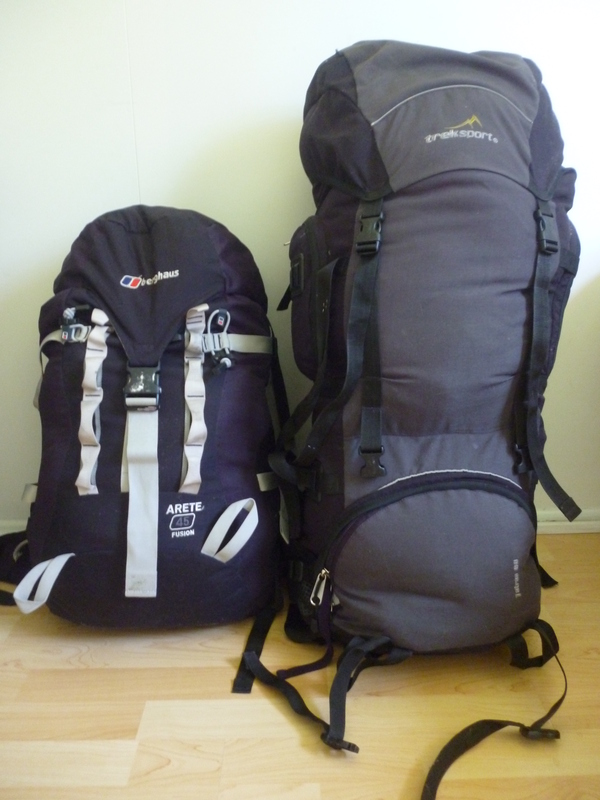 Back in August 2011, I waved my family and friends goodbye and set off under the weight of an 80 litre backpack. Trying to decide what to leave behind was as difficult as deciding what to bring. I wanted to also save some space for any lovely things that I may buy along my way. Oh, how things change! Seven months in and I’ve given things away, left stuff in hostels, lost a few pairs of socks and a top that I thought I loved, and bought very little. And then, during my month-long stay-put in Australia, I decided to downsize. It was a challenge, one that I was excited about. I’d seen backpackers along my way travelling with very little and it was time to stop being envious and start being inspired. Now I’m down to a 45 litre bag. It’s pretty stuffed right now (I’m still trying to figure out what else I can do without). If I want to add anything to my travel mix, something will need to go to make space. Feels less cluttered. Feels good. I don’t need to buy stuff, I don’t need to get attached to pieces of cloth, I don’t need to lug around a pharmacy on my back. I’ve got enough. Right now I just want experiences. Not things.